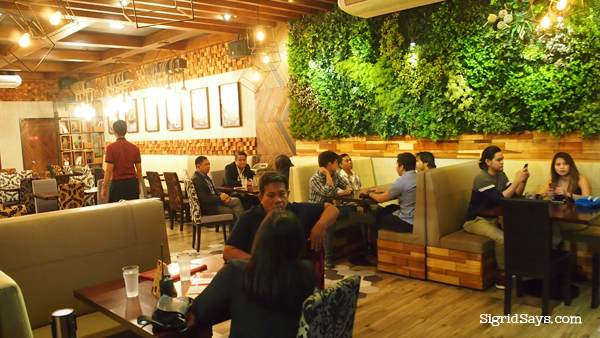 Peri-Peri Charcoal Chicken and Sauce Bar has already been serving Bacolod diners for three years now. But they have moved to a bigger and better location for an enhanced dining experience. Read more. 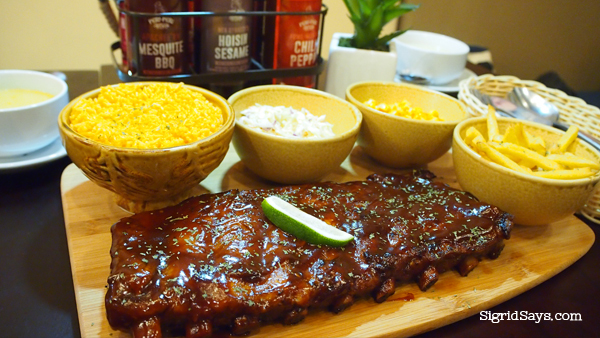 Ribs and chicken combo platter with rice and one side dish. 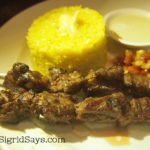 What a filling meal at Peri-Peri Charcoal Chicken Bacolod. 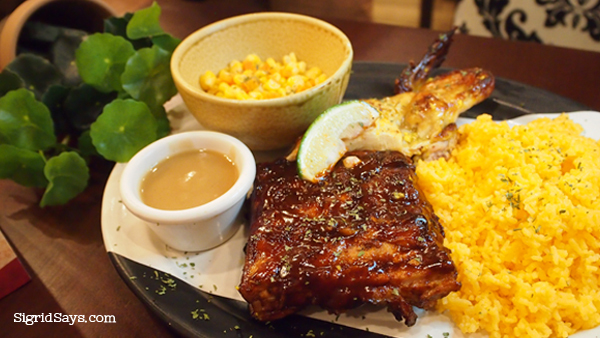 Peri-Peri Charcoal Chicken Bacolod had long prided itself with serving charcoal grilled chicken with a special sauce. 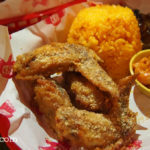 But now, at their new location at the north wing of SM City Bacolod, you get so much more! And now, they are called Peri-Peri Charcoal Chicken and Sauce Bar. First off, it is now true to its name. Aside from serving charcoal chicken, you can choose from among eight different sauces or you can mix and match them. And you can ask for them free of charge. you can dip or smother your chicken in these different sauces. A whole Peri-Peri Chicken with four side dishes (rice or other things, including hummus) and the different sauces. The different sauces of Peri-Peri Chicken. There is something for every taste. I love the Harissa Exotica so much! 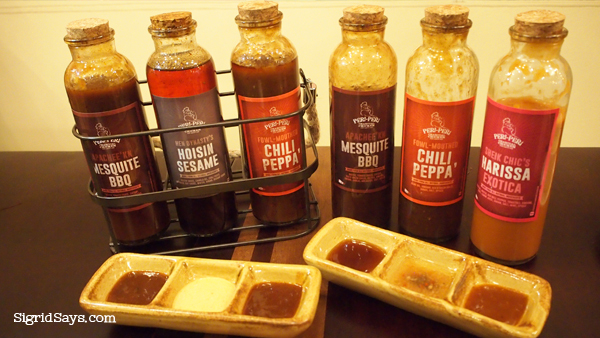 Here are the different sauce flavors at Peri-Peri Charcoal Chicken. 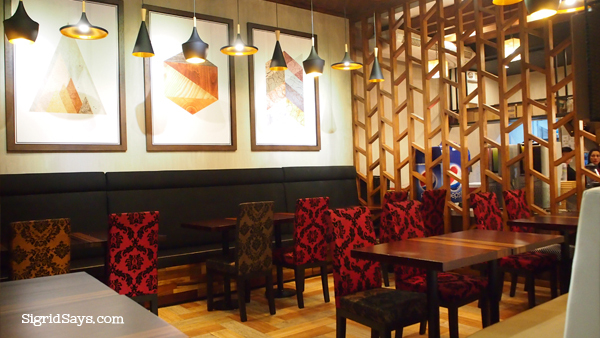 The beautiful dining area of Peri-Peri Charcoal Chicken Bacolod. This area is at the far side of the restaurant. 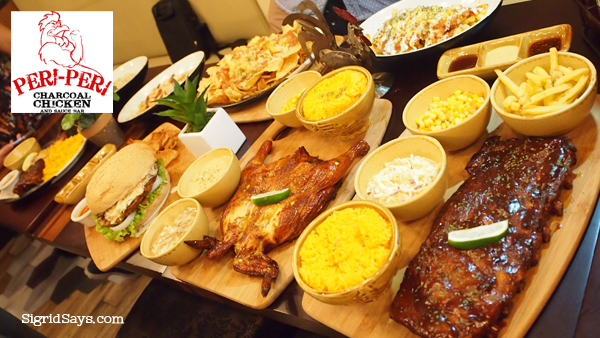 Our feast at Peri-Peri Charcoal Chicken–a lovely treat for the family or group of friends. As you step inside their new restaurant, you can immediately feel transported to a different place. 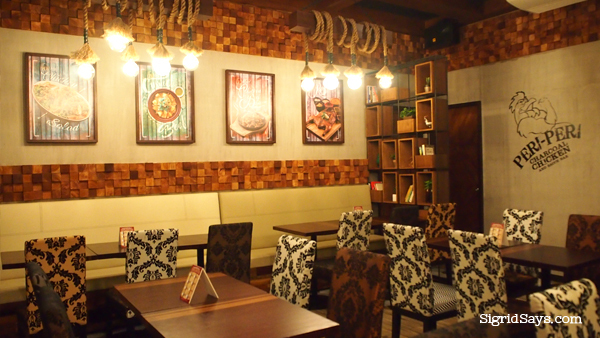 With its generally wooden interiors with, plush seats, interesting decor, and eclectic floor tiles, you will immediately assume that you are in for a treat. A whole rack of tasty ribs! 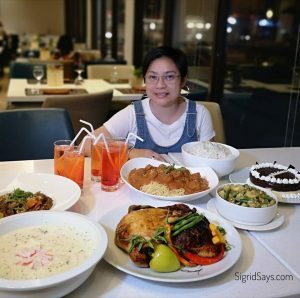 Comes with four side dishes of your choice.If it’s your first time, you will be mesmerized at the interior, as it is not like any run-of-the-mill fast food joint. I love how they treated their lighting design. Except for the faux green wall at the entrance, you would think that you are in the dining room of a bygone era. 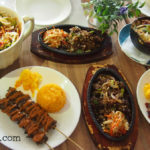 And while Peri-Peri is known for their charcoal chicken, the whole gang would be happy to know that they have a range of delightful dishes from soups, garden salads, ribs, rice bowls, pasta, and even chicken burgers. And oh, they have pizza and appetizers, too. The servings are big and many of them can really be shared. 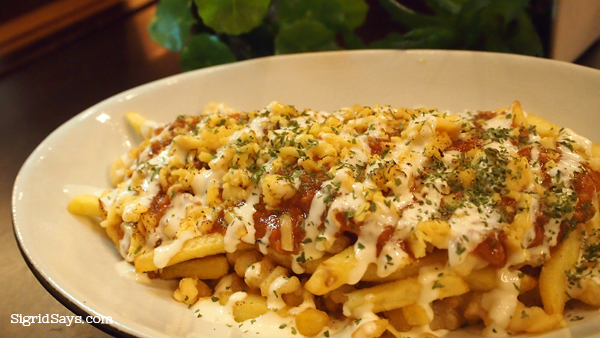 This is a crazy platter of fries–the Patatas Bravas. So good! 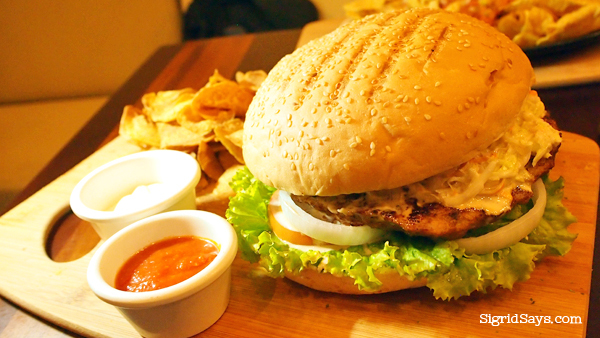 This is the Grande Chicken Burger. I think the diameter of the bread is 8 inches and it has a big patty made of pure chicken meat, grilled to perfection. It has all the works, too. 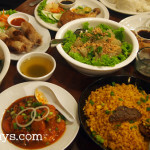 Since we had other dishes, this was shared between the six of us. 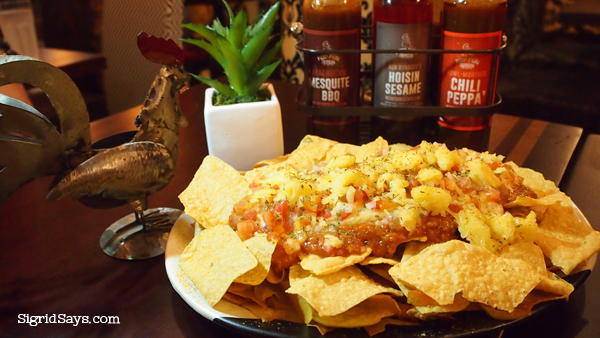 A huge platter of nachos topped with chorizo and salsa….Ahhhhh…. Trivia: Peri-Peri Chicken is not the way of cooking but the sauce added to the chicken. It is a Portuguese cuisine where a sauce made of the African bird’s eye chili, or piri piri, is added. That is why, Peri-Peri Chicken would traditionally be spicy. Meanwhile, my personal favorites at Peri-Peri Chicken, aside from the chicken, are Patatas Bravas, the Plato Porco, Ribs, and the Pasta Tartufo. Hubby loves the Shrimp Aglio Olio naturally because he is a shrimp lover and this pasta dish has got loads of it. 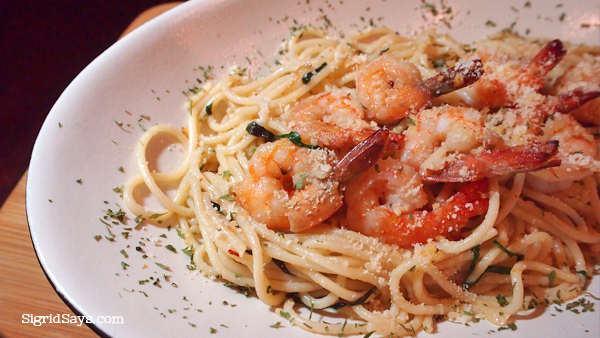 Shrimp Aglio Olio–look at those toppings! I love this! 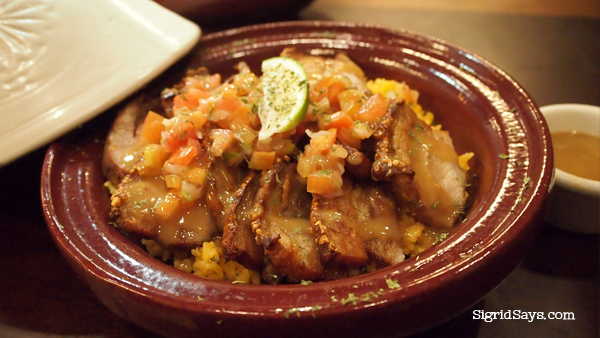 Plato Porco is fried pork that features crispy skin and juicy flesh topped with salsa. This is soooo good! And look at this bowl–the pork slices are lying on a bed of rice. Good enough for sharing! 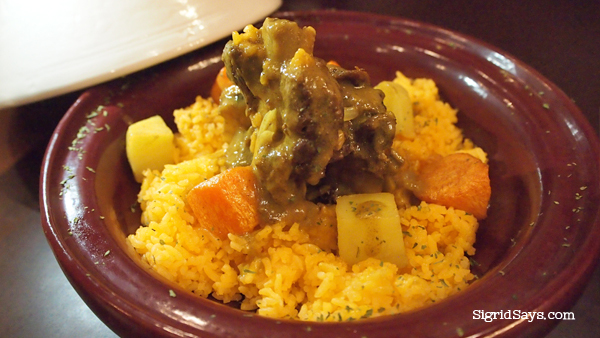 Another lovely choice would be this beef curry. 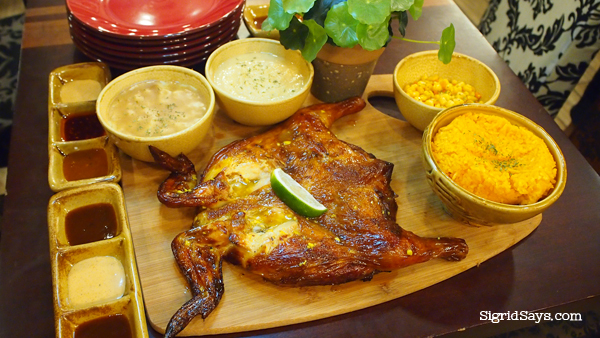 Peri-Peri Charcoal Chicken still offers the unli-soup (P49) and unli-drinks (P49) for every person. If you want to have both, then you pay double. They also have a semi-private function room that can seat up to 20 for small parties. It is elevated a bit and is located on the left side of the entrance. This semi-private function room can accommodate up to 20 persons. Peri-Peri Charcoal Chicken and Sauce Bar Bacolod is located at the north wing of SM City Bacolod, among the rows of flip flops and foot wear stores. They are open during published mall hours. Regular operations is 10am to 9pm. 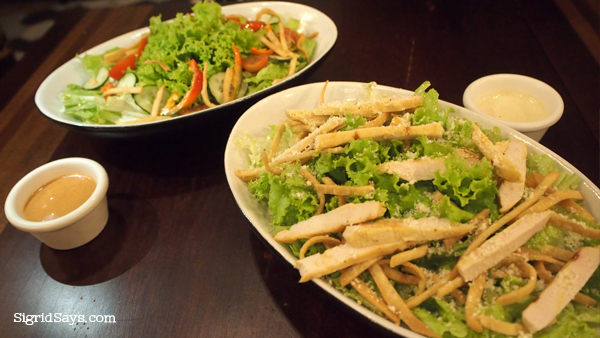 Garden salads are also available.